Genuine security in a sensible way with F-Secure Protection Service for Business products. Companies use more devices and connections now than ever. Network coverage expands to wherever your colleagues are. The increased number of devices and software means more vulnerabilities. Attacks are becoming increasingly more complex and the frequency of attacks has doubled year on year, information security is increasingly challenging. However security is only a small part of what most are doing. So how can you maintain security when time and resources are limited? F-Secure Protection Service for Business responds to challenging security and management need, but does not require significant maintenance or management. It is designed to protect a variety of devices both in office and on the road. The solution provides security for all devices both Windows and Mac, iOS and Android, as well as various server environments. 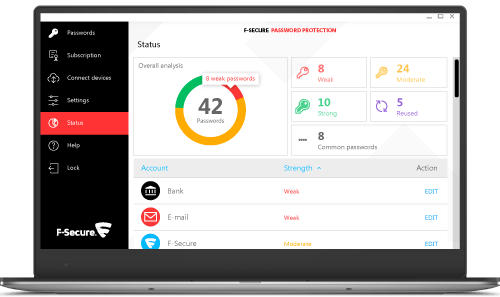 F-Secure PSB is the only computing, mobile and server security solution on the market that combines centrally managed security with repair updates and mobile device management. From Louhi, you get PSB solutions for both your mobile devices and your organization’s computers. If desired, Louhi can also grant you access to the management portal, which gives you more visibility and control over the security of your organization’s devices. Modern security needs to be more than just traditional identification-based control. With Protection Service for Business, powerful, low resource consuming information security works great on Windows and Mac computers alike. It also includes important repair update management. Mobile device management is an important part of today’s network security. The Protection Service for Business solution can protect and manage all iOS and Android mobile devices by using mobile device management and VPN without limiting employee’s activities.